In 1119, a small band of knights seeking a purpose in the violent aftermath of the First Crusade set up a new religious order in Jerusalem, which was now in Christian hands. These were the first Knights Templar, elite warriors who swore vows of poverty and chastity and promised to protect Christian pilgrims to the Holy Land. Over the next 200 years, the Templars would become the most powerful network of the medieval world, speerheading the crusades, pionerring new forms of finance and warfare and deciding the fate of kings. Then, on October 13, 1307, hundreds of brothers were arrested, imprisoned and tortured and the order was disbanded among lurid accusations of sexual misconduct and heresy. But were they heretics or victims of a ruthlessly repressive state? Dan Jones goes back to the sources to bring their dramatic tale, so relevant to our own times, to life in a book that is at once authoritative and compulsively readable. Dan Jones is the New York Times bestselling author of The Templars, The Plantagenets, Wars of the Roses, and Magna Carta. He wrote and presented the popular Netflix series Secrets of Great British Castles and appeared alongside George R.R. Martin in the official HBO film exploring the real history behind Game of Thrones. He is the historical consultant to Knightfall, an A&E drama on the legend of the Templars produced by Jeremy Renner. "Dan Jones has created a gripping page-turner out of the dramatic history of the Templars, from their spiritual warrior beginnings until their tragic destruction by the French king and the pope. It is genuinely moving and a chilling contemporary warning about the abuse of power through persecution and lies." 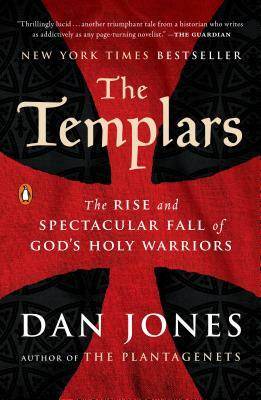 "In this thrillingly lucid account, Dan Jones demystifies the Templars in a story spanning hundreds of years and countless rulers, knights and archbishops, a seemingly disproportionate number of whom ended up beheaded . . . Anyone who has read Jones’s earlier medieval chronicles will know what to expect here: fast-paced narrative history depicted with irresistible verve, bloody battle scenes and moments of laugh-out-loud wit. There are contemporary parallels, too, with the Templars eventually being laid low by the medieval equivalent of a kind of 'fake news': anti-Templar propaganda spread by the church. This is another triumphant tale from a historian who writes as addictively as any page-turning novelist."